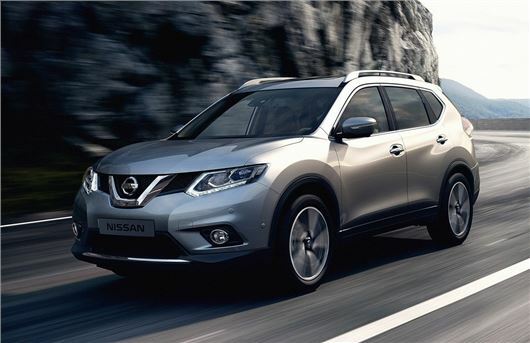 The long-awaited Nissan X-Trail will be priced from £22,995 when it goes on sale this July. That gets you the entry-level 2WD Visia with five seats, which is £2600 less than the outgoing equivalent. The new version of Nissan's SUV gets a far sleeker look and is now much more crossover than 4x4, with styling taken from the impressive new Qashqai. There are four trim levels – Visia, Acenta, n-tec and Tekna. Priced from £22,995, Visia models have 17-inch alloy wheels, LED daytime running lights, Bluetooth, air conditioning, heated door mirrors, follow-me-home lighting, an electric parking brake. The Acenta, priced from £24,795, adds privacy glass, dual zone climate control, electric folding mirrors, a power sunroof, automatic lights and wipers, plus front and rear parking sensors. Moving up to the n-tec adds the Smart Vision Pack, 19-inch alloys, intelligent i-Key locking with push-button ignition, DAB radio, roof rails, a power tailgate, Around View Monitor giving 360-degree view around the car and the latest generation NissanConnect system with smartphone integration and built-in apps. The range-topping Tekna is priced from £29,295 and adds Bi-LED headlamps, heated leather seats and an electric driver’s seat with lumbar support. Safety features include a Blind Spot Warning and Driver Attention Alert plus Nissan’s Park Assist automatic parking feature. Acenta, n-tec and Tekna models come as either two or four-wheel-drive models and are available with Nissan’s XTRONIC CVT transmission. All models are powered by a 1.6 dCi engine with 131PS that develops 320NM of torque. In two-wheel drive manual models, this gives emissions of 129g/km and official economy of 57.6mpg.